Chris Christie is the latest Republican presidential candidate to headline the "No BS BBQ" held at the Rye, New Hampshire, home of former Massachusetts Senator Scott Brown. Brown is undecided in the race, but likes Christie's straight talking style. Brown said, "The reception has always been wonderful, every Town Hall he has is packed. He's telling it how it is." Christie's main target on this day - not his Republican opponents, but President Obama and the Democrats, like Hillary Clinton, who Christie says have helped push a liberal agenda resulting in a new lawlessness in the country that allows "sanctuary cities" marijuana use and violence against police, not to mention what Christie called the worst foreign-policy mistake in his lifetime: the Iran deal. Christie said, "I wouldn't let the president buy me a car" after the deal he made with Iran. Christie, a former federal prosecutor, said the mentality of lawlessness even extends into Clinton's time as Secretary of State. 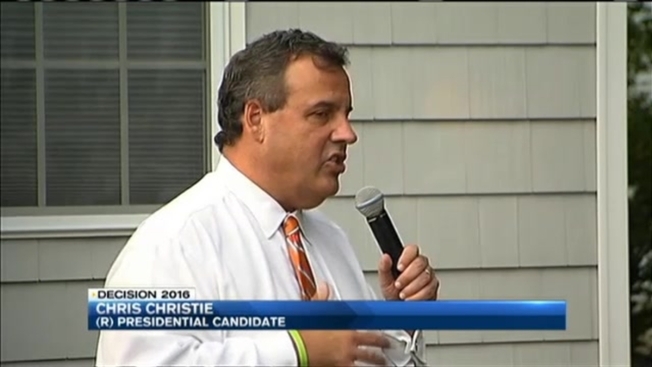 Christie said, "she said I'm sorry about the server - that people are confused about it. We are not confused about it... You had a private server because you didn't want people to know what you're up to." Now trailing Bernie Sanders in the New Hampshire polls, Clinton is, according to her campaign, going to start showcasing her humor and heart. What does Christie make of that? Christie said it is strange for someone to have to tell people they are now going to be relaxed. Christie is experiencing his own slump in the polls which show him in the low single digits. He says the polls mean nothing at this point and that it was Herman Cain and Michele Bachmann who polled at one and two for years ago. We all know how that turned out.